A little about me: I am a 60 year old mother of 4, and grandmother of 10. I am married to a wonderful man, (who is 10 years my junior). We married August 21, 1999. I was divorced twice before, and raised my 4 children for 10 years alone. John adopted my youngest two children after we married. My eldest daughter and son were already out of the house by that time. I was an RN for 18 years, but for physical reasons I had to retire early. I have been at home since November 2011. The physical difficulties are the result of a severe auto accident I had in February 1994. I should have died, but God saw fit to keep me alive and heal my body. I am not supposed to be able to walk. My left hip was destroyed, my left leg detached from the hip, my right hip fractured front and back, the iliac crest on the left was torn in two, I had a damaged left lung, kidney, liver and bladder. My family was told to make funeral arrangements. My best prognosis was to get on disability and buy a wheelchair. I used to think I knew what severe pain was, but I learned a new level of pain from this accident. God did a miracle in my body, and my bones knit together quicker and better than anyone expected. My doctor told me I’d never walk again, but I was back at work 6 months after my accident. Unfortunately though, I suffer much nerve pain, and find it difficult to stand on my feet for more than 2 hours at a time. I press on and don’t allow pain to keep me from doing anything. I lead praise and worship at my church. I have been the Worship leader since 2003. I have 2 CD’s of original praise and worship music which I sell when I am doing conferences and revivals. My husband and I are both ordained ministers. 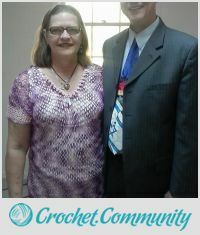 We have been in prison ministry since we were married, and we also do revivals and evangelize. I have been playing the guitar since I was 7. I know minimal stuff on the piano, but I also play the accordion. I use the guitar for leading worship. My children have this idea that I can do anything. I often get phone calls asking me, “mom, can you make me a …..? I know you can figure it out.” I have a creative mind and like to figure things out. Even when I don’t know how to do a thing, I reason it out till I figure out a way to accomplish it. I love creating things. Anything that I can do with my hands, my hands find to do. 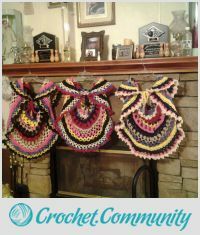 I have worked with needlepoint, embroidery, crewel, plastic canvas, macramé, knitting, very minimal sewing, and my absolute favorite….crocheting! I can crochet with my eyes closed. I use patterns occasionally, but very often I try to make up patterns myself. I have never thought to write any of them down until recently. When I was very little, (I’d say less than 5) I would watch my mom for hours as she would knit and/or crochet. I would beg her to show me how, but my mom was not about teaching. So I watched. And I watched. And I watched. And while watching, I would beg for lessons. Finally, after about 2 – 3 years of begging, my mom decided to give me a ball of yarn and some old knitting needles that she no longer used. She showed me what to do, and then had me knit that same ball of yarn until she was satisfied that I could knit with an even tension. 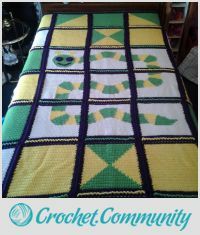 I would knit the ball, frog it, knit it again, and so on. Finally, after several months, she was satisfied, and I made a pullover sweater in pink and gray. I wore it for a long time. I don’t remember exactly when I picked up a crochet hook, but I think I was about 6 or 7. 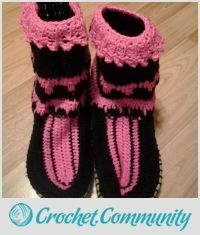 I fell in love with crocheting almost immediately. It is so much easier to me than knitting. 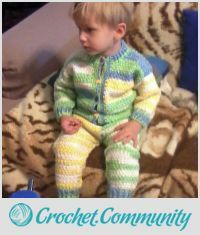 I find it much easier to create without a pattern with crochet. I want to make covers for my furniture. I just have not decided what type of yarn would be best for that. I want to make them in chocolate brown and taupe, or tan. 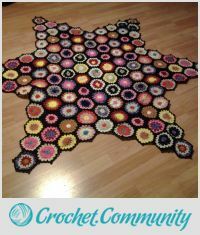 I would also like to make a room sized throw rug that would match the furniture. I want this to be my own creation, not a pattern. My greatest challenge, believe it or not, has been simply understanding patterns. Often I find them too wordy for my taste. When the explanations get too detailed, I find myself getting confused. More often than I can count I have started with a pattern and ended up figuring out how to make a thing myself. It is often simple trial and error. Crocheting is for me a sedative. I have done my best work when most stressed. It calms me and keeps my mind busy. Beyond this, I LOVE to give gifts to people, and my greatest joy has been being able to make something special for someone and then watch their faces when they receive. I love and appreciation I have received from precious people has been my greatest reward. The most significant word of wisdom I can offer is: Patience! Don’t be too hard on yourself. We all had to learn and every mistake is a learning experience. I have found I learned more from my mistakes than I ever did from just working a project. Don’t give up and don’t limit yourself to thinking that you “can’t” do something. With practice and patience, you can do anything!! !